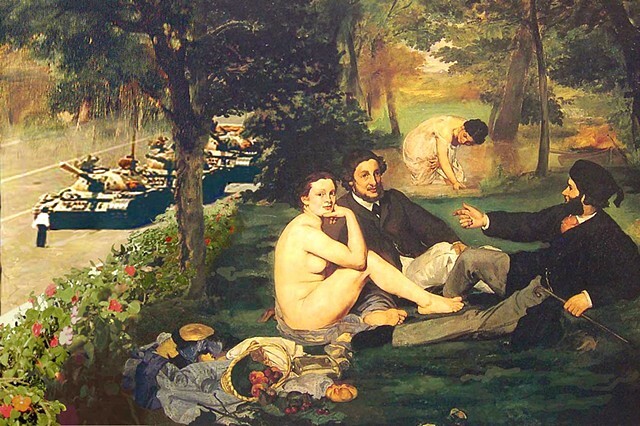 TIM HIGH - Lessons in History Series "After Manet / Dejeuner sur l'herbe"
"After Manet / Dejeuner sur l'herbe"
Edouard Manets painting Déjeuner sur lHerbe, (Luncheon on the Grass) 1863 was one of a number of impressionist works which broke away from the classical view that art should obey established conventions and seek to achieve timelessness. The painting was rejected by the salon that displayed paintings approved by the official French academy. The rejection was occasioned not so much by the female nudes in Manets painting, a classical subject, as by their presence in a modern setting, accompanied by clothed, bourgeois men. The incongruity suggested that the women were not goddesses but models, or possibly prostitutes. In my mind, this painting resonates with the same spirit of gratuitous hedonism that has become the brazened talisman of contemporary Western culture, whose primary compass headings are riveted upon unrelenting gain of material excess and new heights of sensual pleasure. I find this mindset completely antagonistic to the raw courage and starch of character required of a faith-filled martyr. In the avenue on the lower left we recall the Chinese student who stood down an entire column of tanks near Tienanmen Square, which were restrained not by the courageous young student, but by the watchful eye of the Western press core.